We specialize in vehicles "no title - paperwork and/or messed up paperwork" left behind on your auto dealership lot. Autos left behind or abandoned at your lot, no problem. Illegally Parked & Abandoned Vehicle Pickup in Phoenix Arizona. Our experience, skill and reliability have made us the preferred company for towing/impound services since 1985. 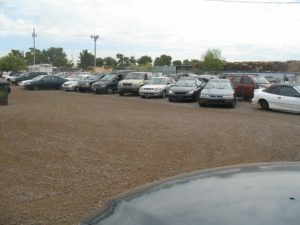 Allied Towing specializes in vehicle towing and impounding of abandoned and illegally parked vehicles. 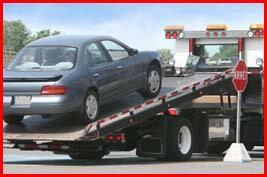 We serve property owners and managers in the Phoenix area in need of vehicle impound services. Property Management Companies, Apartment Complexes, H.O.A. 's, Retail Property and Commercial Properties. Abandoned on property? Allied Towing can help you resolve your vehicle parking issues and offer a free consultation to insure the full compliance of all local and state laws. Allied Towing provides free tow signage with parking regulations for your jurisdiction, along with installation and replacement. 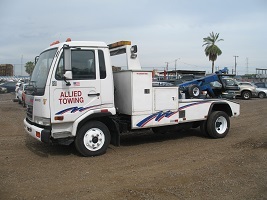 Allied Towing has been in the business of removing vehicles from commercial, retail and rental properties since 1985. Our primary goal is to meet our customers' needs in a fast, efficient and professional manner. Some of the properties we have removed vehicles from include shopping centers, strip malls, apartment complexes, restaurants, professional services complexes and mobile home parks. Wherever there is a need to remove abandoned, inoperable or illegally parked vehicles, our team is capable and ready for the job.